A high fever and chills in a toddler is the body’s way of saying that something out of the ordinary is occurring. Possible causes include a viral or bacterial infection. If your toddler has a fever higher than 102 degrees Fahrenheit, contact her pediatrician immediately. A toddler refusing to eat or drink is also a reason for concern. When in doubt, always consult her pediatrician. You can also take a few steps to reduce your toddler’s fever and make her more comfortable. A toddler with a high fever and chills is at risk for dehydration, MayoClinic.com warns. Encourage your toddler to drink fluids to reduce her risk. Water, juice and broth are a few options. Talk with your doctor about offering an oral rehydration solution to prevent dehydration; these drinks are available at most drugstores. Run a lukewarm bath for your toddler. Allow her to sit in the bath for about 5 to 10 minutes. Watch her closely — if she starts to shiver, get her out of the bath. Shivering produces muscle heat. When the muscles shake, your toddler’s temperature will rise. Dress your toddler in light clothing. If she uses a blanket, avoid heavy comforters. Instead, select a light blanket, which won’t elevate her temperature. Resist the urge to administer a fever reducer without doctor's approval. If your toddler has a fever of 102 F or higher, your doctor will likely recommend a medication like acetaminophen or ibuprofen. Use as directed; overdose of fever-reducing medications has serious consequences in toddlers, like kidney damage or death. Never give any child aspirin, which has been linked to a rare and sometimes-fatal condition called Reye’s syndrome, MayoClinic.com warns. 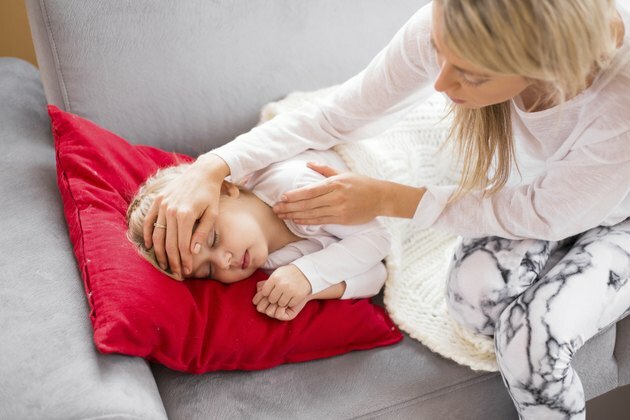 If your child’s doctor suspects that a bacterial infection is causing a high fever, she might prescribe an antibiotic. Administer the medication as directed, even if your child feels better. Discontinuing the use of antibiotics can make your child’s illness worse. Don’t use antibiotics for the common cold or viral infections.